Lock in a great price for Hotel Cara 1928 - rated 9 by recent guests. 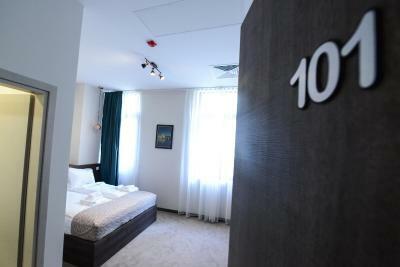 The hotel is in the city center, the rooms are comfy and clean. Staff at reception and in general were very very kind and professional. Great location, decent sized room and friendly team of staff. Complimentary bottle of water along with well stocked mini bar (didn't use!) Good value supermarket in basement of nearby shopping centre across the main square. Perfect location. Breakfast was ok, nothing fancy. Very central and excellent value for the price. Very clean and everything new. Minibar was inexpensive. Personel was really nice and kind, room was clean, tidy, comfy. Location is perfect, almost right on the main square. Price/value is really good, but breakfasts were huge disapointment. All in all, and especially considering the price, this small hotel is an excellent choice for a couple days of sightseeing in Skopje. Everything is within walking distance, the bed was VERY comfortable, and everything still feels quite new. Very kind and helpfull stuff. Great location. Good breakfast. Thank you. The location of the hotel is amazing. 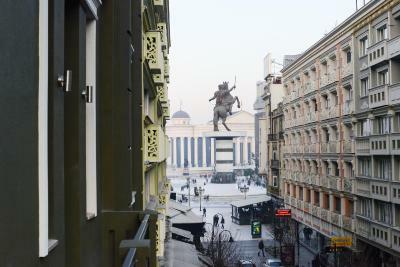 It is located in the heart of Skopje. The place is clean and the staff are very helpful. Unfortunately I had an emergency and I had to leave early, so they made 10% discount which was a good thing. 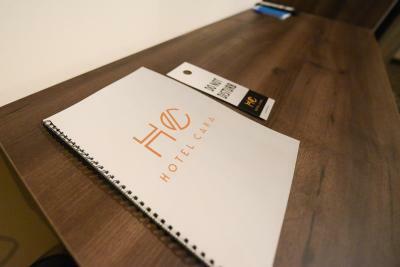 One of our top picks in Skopje.Located in the Skopje City-Centre district in Skopje, Hotel Cara 1928 offers 4-star rooms with free WiFi. Featuring a bar, the hotel is close to several noted attractions, around 350 yards from Stone Bridge, a 2-minute walk from Macedonia Square and an 8-minute walk from Kale Fortress. The accommodation offers a 24-hour front desk and an ATM for guests. Guest rooms at the hotel come with a seating area and a flat-screen TV. The private bathroom is equipped with a shower and free toiletries. The rooms have a desk. A continental breakfast is available each morning at the property. Guests can dine in the in-house restaurant, which serves a variety of Mediterranean dishes. 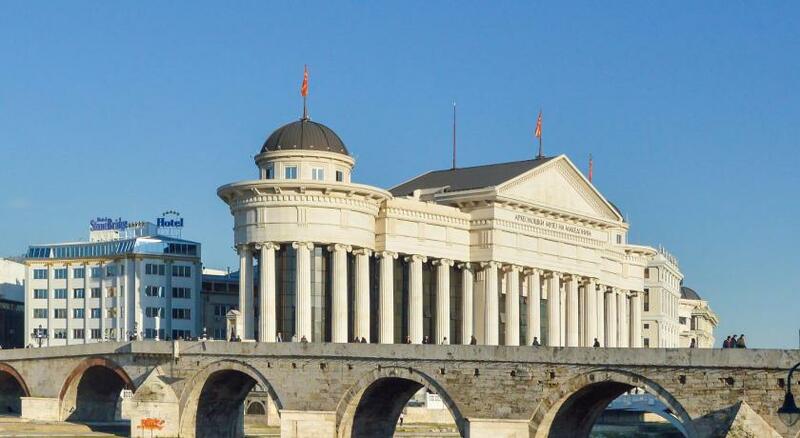 This is our guests' favourite part of Skopje, according to independent reviews. This property also has one of the best-rated locations in Skopje! Guests are happier about it compared to other properties in the area. 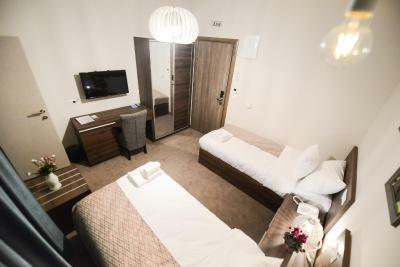 Hotel Cara 1928 has been welcoming Booking.com guests since 8 Feb 2018. When would you like to stay at Hotel Cara 1928? Public parking is possible at a location nearby (reservation is needed) and costs EUR 10 per day. House rules Hotel Cara 1928 takes special requests - add in the next step! Hotel Cara 1928 accepts these cards and reserves the right to temporarily hold an amount prior to arrival. One of the most picturesque neighbourhoods in Skopje! Very poor breakfast. Rooms are small. Choice at breakfast limited but what I had was tasty. Omelette, tomatoes and sausage. No continental options available the morning I are there. The shower door did not seal against the floor so a lot of water covered the bathroom floor every time I took a shower. The location was amazing and the staff were very nice plus the facilities were very clean. Huge bonus was the quality of the wifi, no issues at all with the connectivity. There was only instant coffee with the breakfast. We were given a room which smelt strongly of cigarette smoke but when we told the staff they responded quickly and we were given another room. No real tea or coffee at breakfast. It was mint tea and instant coffee. The breakfast was not as described on the menu and hot items were cold. Location is excellent, in the centre, staff was nice and helpful. Breakfast was fresh and made very fast! Highly recommended! The breakfast was ok, but far from tasty or good. I expected much better breakfast. It was very very poor and breakfast like this you can expect in some hostel not in 4* hotel in city centre.